Saskatoon Cycles August 2016 Newsletter – Bike Week Saskatoon! August 13th-14th – Get Ready to Ride Bike to Work Clinic at Bruce’s Cycle Works! August 13th – The Better Good Living Tour beginning at the Better Good! August 13th-14th – The Canadian Open Bike Polo Championships and Party at the Underground Cafe on August 13th! August 15th – Bike Scavenger Hunt Fundraiser – For MS Society! August 16th – The River Volta celebrates Saskatoon’s Bike Week! Bike inspired works, open mic and desserts at D’Lish by Tish! August 17th – Bike to Work Day! Check out all the commuter stations and start planning your route and don’t forget to BYOM (bring your own mug)! 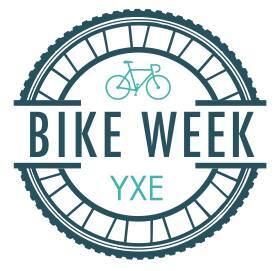 August 17th – Ryde YXE is offering FREE classes all day in support of Bike to Work Day! You can register here to try a different kind of cycling! August 17th – Slow Roll – Bike Rave Edition beginning at the Farmers Market with a live streaming curated playlist and dance party interlude! August 18th – Introduction to Bike Tune-Ups from 6pm to 8pm and The Basics of Bike Touring from 8pm to 10 pm at the BCBC! August 19th – Darkmatter Overnighter at Beaver Creek! Bike camping departing from Buena Vista Park at 5:30pm! Team leader emails team name and total number of people in workplace to biketoworksaskatoon@gmail.com by Aug 15th. Get your co-workers motivated to bike to work on August 17! Stop at any Commuter Station for free refreshments, and pick up a Commuter Challenge card. Write your name and contact info on it, and have your card stamped. Hand your stamped Commuter Challenge card into the team leader and you will be entered into a draw to win a gift basket from The Bike Doctor. Workplace (of over 15 people) with the highest proportion of cycle commutes will win a gift basket from Breathe Cycle Studio, including a 6-pack of class cards, a Breathe tank top, and a Breathe t-shirt! Thought you had to pick just one awesome station to stop at on your morning BTWD commute? Fear not, you’re welcome to stop by as many stations as you’d like, between 7 and 9 AM! In fact, we have a prize pack ($100 value) for the Ultimate Commuter who stops by the most stations on their bike. To participate, simply ask for an Ultimate Commuter Challenge card at your first Commuter Station stop, and get it stamped at each location you visit. Leave it at a Commuter Station before 9 AM with your name and contact info written on it to be eligible to win! Take a photo of yourself commuting by bike on Bike to Work Day, upload it to Facebook, Instagram, or Twitter and tag #yxeBTWD. Time: anytime before 7:00 PM on August 17. For info on all Commuter Stations and to map your ride, visit The Bike to Work Day site and for updates, check out the Facebook event page: Bike to Work Day Saskatoon (#yxeBTWD). The Bike Valet is still going strong this summer! We have a few events coming up that you can volunteer at: Potash Fireworks Festival from September 2nd to 3rd and the Race Against Racism on September 18th – please contact us if you’d like to donate your time and have a fun at the Bike Valet – it’s your last chance for 2016! The Saskatoon Cycles 2016 AGM has been schedule for November 16! If you are interested in helping us plan the AGM or can assist us in making sure it runs smooth – please contact us! Saskatoon Cycles is also looking for volunteers to be on our advocacy committee – if you have a passion Active Transportation Plan and spreading the word – we’d love to have you aboard! Do you think Saskatoon Cycles should organize an Open Streets event in 2017? What is it? Can you help? Have ideas? Contact us! City Council approved Active Transportation Plan on June 27 but there is still a lot of work to be done in short term and Saskatoon Cycles has a plan! Contact us if you’d like to learn more! Have you checked out the Livable YXE website? They are going to canvass all candidates prior to the October 26th municipal election to compile a report card for each under several categories: health, environment, public transportation, active transportation, access and equality, economics and arts and culture – so you can make the most informed decision prior to the election! Stay tuned to the website for updated information. Do you LOVE Active Transportation? There is a Pro Walk/Pro Bike/Pro Place forum on September 12th to 15th in Vancouver! Check out the full schedule here. This will either make you laugh or cry . . .